The story of Moses is arguably one of the most famous ones in the Old Testament, up there with the likes of Noah’s Ark, Adam and Eve, and Joseph and his infamous Technicolor Dreamcoat (which doesn’t really factor much into the story that much, come to think of it – damn you, Andrew Lloyd Webber!). Many films have been made about it in the past – including, most famously, Cecil B. DeMille’s epic The Ten Commandments and DreamWorks’ animated The Prince of Egypt – and you can bet that there will be many more to come in the future. 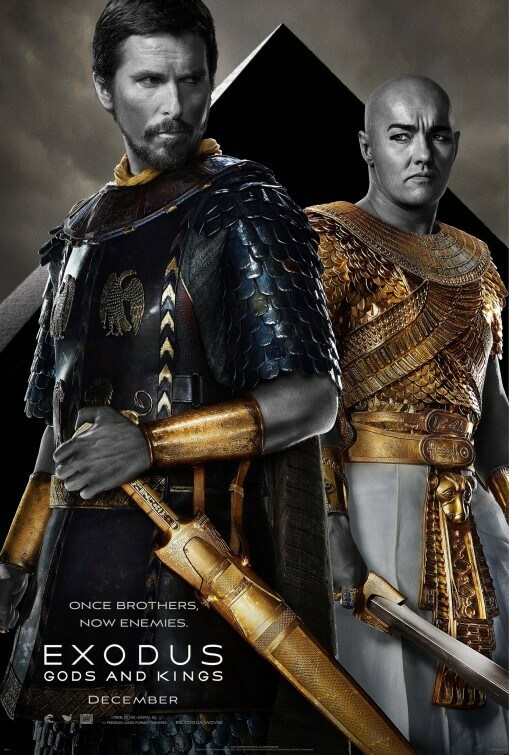 Now, Ridley Scott has thrown his version into the ring, entitled Exodus: Gods and Kings, hoping that it will rank highly among its fellow adaptations. But how does it truly fare? Sadly, this is perhaps the most problematic big-budget version of the story in recent years; a bloated rendition that will bore those all too familiar with the story while not really doing much for any newcomers. The fact that this is such a well-known story doesn’t lend itself much possibility to do new things with the material; do so, and it’s likely you’ll endure the wrath of one of the biggest religions in the world. At an unnecessary two-and-a-half hours, you find yourself counting down the seconds until the next big plot point rather than get sucked in to the environment and its characters. Scott had previously attempted to “epic-ize” (not a word? It is now) another legend, namely Robin Hood back in 2009, but that amounted to nothing but a dull and uneventful excuse for the director to relive his Gladiator triumph (right down to having Russell Crowe as the lead). It’s the same here, but on a grander and more exhausting level; a giant battle scene near the start of the movie has no reason for being in a film like this, only to satisfy audiences who for some reason were expecting huge amounts of swordplay in a Biblical epic. 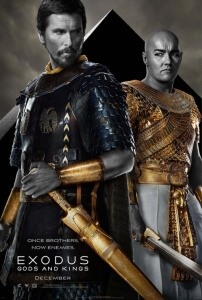 The white-washing of major characters has caused a bit of controversy, lambasting the fact that white actors like Christian Bale were cast as Egyptians while the more ethnically-appropriate actors are relegated to bit parts or extras. While it can be distracting to see the racial boundaries be breached in such a way, our goal is to judge the performances based not on the colour of their skin but rather their skills as actors; with that said; though nobody does a godawful job there’s nothing that would single anybody out either. Bale is in his usual “sullen hero” mode here, while Joel Edgerton can barely comprehend facial expressions thanks to the large amount of make-up and fake tan all over him. The supporting cast are mostly wasted, including Aaron Paul whose unorthodox casting is more interesting than his actual character, and Ben Kingsley in the second film of his career where he and an additional amount of Jewish patrons are saved by a brave soul originally on the side of their oppressors (if you can name that other movie, step up and collect your grand prize of nothing). Sigourney Weaver, on the other hand, might as well have not been in the movie at all; her character is so unnecessary in the grand scheme of things that she disappears almost as quickly as she was suddenly pushed our way. It’s very possible that the majority of her scenes ended up on the cutting room floor, but even then the film makes no attempt to have her be useful at any time. The casting of recognisable faces in these particular roles is one of the many examples that Scott is going broad and epic just for the sake of it. His set-pieces, including aforementioned opening battle sequence, are only big and boisterous because he feels that simply by making something look grand he can command great visual storytelling. If he wanted to do that, then he might have wanted to skim down the expository dialogue a little – everything about Moses’ iconic delivery in a basket along the River Nile is told through dialogue instead of through a more appropriate visual medium – or at the very least be a bit more cautious with historical accuracy, such as the introduction of archery some 400 years before its invention. It’s likely to annoy religious audiences as well, especially with the depiction of God as a bratty child (making all the following plagues the product of a violent temper tantrum) and its stunningly lazy version of the famous parting of the Red Sea. In short, not many people are going to find much to like with this film. However, there are a handful of decent moments in the film. Some of the sets are very impressive, as is the cinematography some of the time, and Moses’ reaction after being confronted with the pre-pubescent Almighty is quite effective and suggests some interesting questions about whether he’s truly seeing him or not (even though the film doesn’t expand on it in the slightest). But these are few shining moments in a shadowy attempt to retell a classic story, arguably done much better and more powerfully in The Prince of Egypt – and when a DreamWorks cartoon handles the story of Moses more effectively than a big-budget blockbuster like Exodus: Gods and Kings, then you know that’s a plague in and of itself.